Can be seen in this blog post: The Leak And The Coming Flood – The Daily Dish | By Andrew Sullivan. Like I said in my earlier post, business is the next target. And the material being sent to Wikileaks appears to be ramping up, much as I suspected. There is even a reference to Napster in this post! Like I also said, what is the real story here is coming into focus, and it is not about the leaks regarding the U.S. government. It is bigger and wider than that. This article in the Guardian, WikiLeaks: The revolution has begun – and it will be digitised by Heather Brooke supports some of the ideas in my previous post on Wikileaks. It dives deeper into them, though, and is worth a read. In reading the arguments that say Wikileaks should not be doing what they are doing, I am sympathetic to the feelings that people have about this, but I find there is weakness in the arguments that I’ve seen so far. Let’s take one of the first ones: “Julian Assange is a <insert negative description here>”. If this is your argument against what Wikileaks has done, let’s assume that he had resigned at some point and yet the leaks still continue. If you still don’t accept that it is acceptable, then whatever feelings or thoughts you have about Julian Assange are besides the point. If you now think it is acceptable, then it has nothing to do with the leaks themselves, and more than you don’t like Assange. I can see why people don’t like him, but to me, that is beside the point. The next argument against Wikileaks is that it is treasonous. A related one is that the U.S government should legally stop Wikileaks from publishing the material. The problem with that is that as far as we know, Assange and the rest of the Wikileaks team are not Americans, therefore they cannot be tried for treason, not being citizens of the U.S. As well, Wikileaks (so far) is outside U.S. jurisdiction, making it difficult to stop them legally. will go on”. Some of this is very unlikely. For one thing, people who work in offices need to document things. This is unavoidable, regardless of where you work. And nowadays, documenting things means storing it in a computer that is accessible via a network. The notion that large diplomatic organizations like that of the United States will limit themselves to phone calls is absurd. Embassy personnel, like personnel everywhere, need to demonstrate that they are working and being effective, and the way to do that is to document it. Preferably in a computer that other people can get access to, so that they too can be effective in their job. This means less phone calls and less compartmentalization, which results in many links in a chain. All you need is one weak link in that chain to end up in a document dump to Wikileaks. As for tracking Julian Assange down and I assume killing him or stopping him somehow: I will get to that in a minute. But what Wikileaks is doing is categorically different. Many readers have written in to say — without knowing quite how to put their finger on it — that the indiscriminate nature of the release, just everything they could get their hands on — seems more like an attack on the US government itself than an effort to inform American citizens about what their government is doing on their behalf. And even though I’m in the business of unearthing and sharing information, my gut says they’re right. I would also argue that Wikileaks must aim to be indiscriminate. If anything, if they were to start publishing a portion of what they received, the argument against them would be: what gives you the right to decide what should be released and what should not. By being indiscriminate, they do not judge or decide on the relevance of the material they receive. Furthermore, if they did start to discriminate, it is very likely that someone else would set up infrastructure to publish this material instead. By increasing the chance of publication of the material (which is what they did in their arrangements with various publications like Der Spiegel, the New York Times, etc.) and by not editing the material, they increased their chance of getting the material in the first place. Years ago Napster burst onto the scene. And while the recording industry has laboured considerably to stop downloading and sharing of music, I think it is safe to say they have been unsuccessful. Even if the recording industry has been successful in stopping some of the initial activity like the work done by Napster, they soon found out it was not about Napster. This was something much bigger. People have created IT systems to overcome the restrictions that prevented file sharing, and they have gone on to share music to a much greater degree. You can argue whether it is right or it is wrong, but you cannot dismiss what has occurred. Likewise with Wikileaks. Getting back to the notion of tracking Julian Assange down and killing him or stopping him somehow. This result will be no different than stopping Shaun Fanning and Napster, despite the difference in severity. For the cat, so to speak, is out of the bag. If someone can argue convincing how the cat gets back in the bag, I’d like to hear it. Instead, what is very likely to happen is that Assange and Wikileaks are going to turn and pivot and turn their spotlight on some organization that everyone loves to hate: bankers. And after that, they are going to snare someone else. I beleive they are going to continue to change the conversation as they go forward, if they can. And the arguments above will fall by the side. Ultimately much of the discussion is focused on the wrong thing. However serious these individual matters are, ultimately it is not about the U.S. government or Wikileaks. It is about the increasing difficulty organizations are going to have protecting their secrets and limiting the access to information that they have. This should be a surprise for no one, but it seems to be. The challenges individuals have in separating the public from the private are the same ones that organizations are going to have. The challenges that media companies have with limiting access to digital representations of what was once scarce media are the same ones organizations are going to have. “”it makes it (Lanvin) so accessible to all kinds of young people to be able to afford it and wear it”. I liked that idea alot: the accessibility of great design and great style — although not great materials — for young people. Why shouldn’t great style be accessible to everyone, I thought? If you are a big fan of the work of Alber Elbaz at Lanvin, or dream of being able to wear something by Lagerfeld, then this is your chance to buy it and wear it, regardless of the fact you are far from rich. Great clothes for everyone, I thought. Now, if you are lucky and smart, you will pop into H&M in the next few day or so and leisurely get something from Lanvin that you love and that was returned by someone who gorged themselves on the stuff today and then decided they no longer wanted it. More likely you won’t get anything at all (save the rather unexceptional and overpriced scarves that still languished on shelves even when everything else had been snatched up). For Lanvin, the move toward a wider audience signals less a departure from its luxury roots than a further attempt to expand its market with new products and retail outlets. The company recently opened a store on Madison Avenue. But for most people, it is neither here nor there. Whatever it is about, it is not about making great clothes accessible to people. (If anything, the work that Isaac Mizrahi did for Target or the lines that Martha Stewart did for K-Mart or Home Depot are about that.) It is more about getting great publicity for H&M and the annual designer chosen to do a line for them. 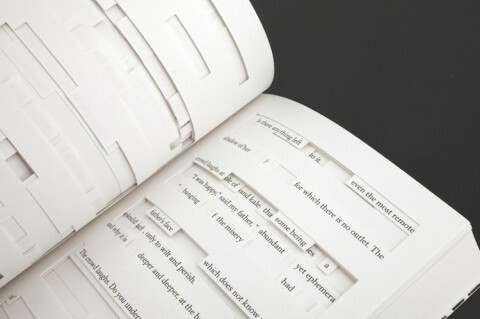 Is Jonathan Safran Foer’s new book the future of books? Book printers said … “could not be made.” Belgian publishing house Die Keure proved them wrong. Jonathan Safran Foer’s book is an interactive paper-sculpture: Foer and his collaborators at Die Keure in Belgium took the pages of another book, Bruno Schulz’s The Street of Crocodiles, and literally carved a brand new story out of them using a die-cut technique. I have some printed books that are great to read and fascinating objects in themselves. To sell books in the future, more books will need to be made this way.